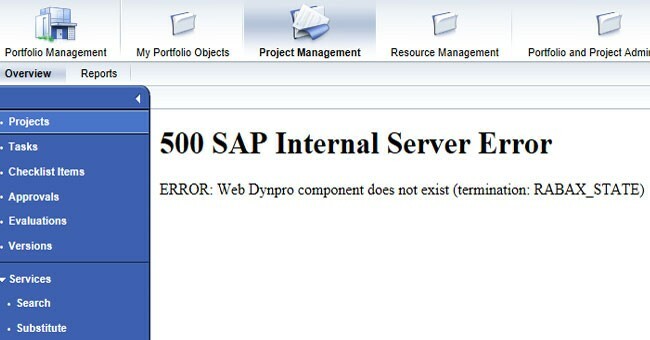 When using Web Dynpro application to issue or return personal or functional equipment. I either use the button "Document Preview" or create a return document while selecting the link: "Display Return Document As PDF Form". 500 SAP Internal Server ErrorERROR: Access via 'NULL' object reference not possible. (termination: RABAX_STATE). The error you are facing is because of some programming error. Therefore please apply Software Component EA-DFPS with 1 Correction Instruction in order to avoid the termination message. After applying the correct code an empty screen will appear instead of termination message. Please use forms /ISDFPS/PE_ISSUING_DOCUMENT and /ISDFPS/PE_RETURNING_DOCUMENT.